When I saw Crazytalk 7 on the app store I was really excited. If you’ve ever seen a jibjab cartoon, you’ll recognize the style of cartoon that this software creates, but at the price of $30 I was hesitant about the matter of whether I should buy it. Luckily, the company let me demo it so that I could write this review here. So what is Crazytalk? Crazytalk is a piece of software that turns ordinary photos into animations. What does this mean for animators? 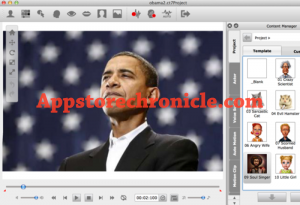 It means that you can create a decent talking model of Barack Obama, or Steve Jobs, or Donald Trump straight from a photograph in about five minutes, and you can even animate inanimate objects using sprite parts. It’s really cool. Making animations is literally as simple as importing a photo, tweaking a few things in their very simple settings (simple in a good way) and recording your voice. The software even does the hardest part of animation (lip syncing) for you, and it does it quite well. You can give your face pre-made expressions or build your own, and it’s all very simple. So here’s my problem with the software. It only allows you to animate heads. No bodies or movement beyond the head. A talking head has limited uses. It’s basically limited to novelty videos, education videos, and greeting cards because most serious animations need more movement, and that limitation makes it too pricey for me to fully recommend. Reallusion, the maker of crazy talk does make software for full animation, called Crazytalk Animator, but it’s not currently available on the mac, and a company rep told me it won’t be available until mid next year. The software itself is fantastic for what it’s meant for: bringing excellent looking animation to the masses, and creating informational videos, or short gags and greeting cards, and if you’re willing to spend $30 for a great piece of software for that, go for it. Just know that this is not a software for serious pro animators.